If you are familiar with Evernote, you know that it’s an app and Web service that lets you save and organize notes, PDFs, images, and all kinds of other random bits of data. But you may not have considered how useful and versatile Evernote can be for business use. Here are some of the ways I’ve incorporated it into my workflow. The same goes for images, PDFs, audio notes, and pictures from mobile devices (or my Mac’s iSight camera): I can import them into Evernote, and they’ll all be synced to the cloud. Thanks to its browser plug-ins, Evernote is also great for clipping content from the Web; again, those clippings get synced. Once all those different bits of data are on the Evernote servers, they’re synced to my other Evernote-capable devices, which include my iMac, iPad, and the Windows PC at my office; there are also Evernote clients for Android, Blackberry, Windows Phone 7, and WebOS. And you can access your Evernote data online using most standard Web browsers. Another thing I like to do with Evernote is to organize data by project. For example, every time I travel for work I set up an Evernote project specifically for that trip. In it I keep a note with my itinerary, PDF images of my boarding pass and airport shuttle tickets, maps of the places I’ll be (as images), and a rich-text file containing notes I’ve taken beforehand. Having all of that information in one project folder makes it easy to access as I trudge my way through a travel day. Because I have an Evernote Premium account ($5 per month or $45 per year), I can download local copies of those project folders to my iPad and iPhone and so have access to them even when I don’t have an Internet connection. And while I’m traveling I can take pictures of receipts, business cards, and other paper detritus I want to save using the Evernote iPhone app; that all goes in the trip folder, too. Thanks to its built-in OCR capabilities, Evernote can read and save text from images like these. In addition to setting up folders for specific projects, you could also create them for individual clients, for sales leads, or for almost anything else that calls for collecting information in a variety of formats. Note: In addition to letting you download local copies of your data, Premium accounts add several other useful features: They enable you to OCR PDFs (more on that in a second). They also raise the monthly upload cap (from 60MB to 1GB), support bigger files (50MB instead of 25MB), provide versioning for written notes, and more. Evernote doesn’t just hold your data; in some cases, it can actually improve on it. Specifically, when Evernote imports an image file, it scans that image for text and then adds that text to the image file’s index. It’s a really powerful tool. For example, I’m a tea geek. 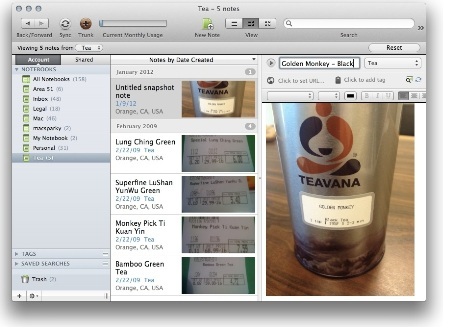 When I find a good tea, I snap a picture of its label and save that picture to Evernote. Evernote’s servers then analyze the uploaded image and save whatever text they can recognize. Which means that I can later search Evernote for monkey picked oolong and my picture of the tea label will show up–even though I never typed that word myself. I can imagine lots of productive uses for this feature–processing and indexing business cards is only the most obvious. If you have a Premium account, Evernote will also perform optical character recognition on uploaded PDF files. Given how common PDFs are, this could be a huge productivity-booster. One other business-friendly feature: Evernote offers some basic collaboration and sharing tools. Specifically, you can choose to share a notebook with specific people or the entire Internet. This is particularly useful if you work with other Evernote users. These sharing tools aren’t anything fancy; they don’t track changes or maintain file-audit trails. But for simple projects, they could be a helpful tool. Though it’s easy to get data into Evernote, it’s not so easy to get it back out. 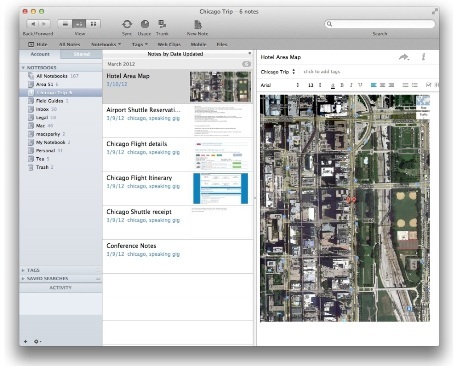 You can drag JPG and PNG files from the Evernote app to your Mac desktop. You can’t do that with PDF files, though; the best workaround for those is to use OS X’s built-in print-to-PDF functionality. If you try to copy and paste rich-text notes from Evernote into a Mac word processor, the formatting won’t necessarily survive the trip. Some users find these data-export limitations a deal breaker, while others are able to live with them just fine. Because it can handle so many different kinds of data and organize notes by folders, Evernote is a great tool for organizing projects or business trips. You also need to consider security. While you can designate specific data to be stored locally only, the real benefit of Evernote is its cloud storage. But if you work with sensitive data, it may not be wise–or even permissible–to save it in the cloud. You can encrypt selected portions of text notes, and Premium users can encrypt whole files before uploading. But regardless, Evernote is cloud storage and that carries some risk. All that said, I think Evernote can be a really handy business tool. I’m relatively conservative in what I do with it; I don’t, for example, take full advantage of its tagging and search capabilities. (For an excellent introduction to what the app can do, check out Brett Kelly’s $25 ebook, Evernote Essentials.) But even so, I find Evernote an indespensible tool on business trips, for quickly accessing images and other files I use a lot, and, of course, for cataloguing my tea.